IT was the exclusive gig that had pop music fans pleading and begging for tickets, all of them desperate to see a legend at work under the unmistakable glare of a giant, shimmering glitterball. 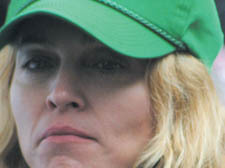 But Madonna doesn’t come cheap – and the New Journal has learned that the singer’s fleeting appearance at the Koko nightclub cost a whopping £1.5 million, thought to be the most expensive gig ever staged in Camden Town. As she only sang five tunes, that works out at £300,000 per song. Madonna played at Koko – the former Camden Palace music hall – in November 2006 to launch her album Confessions on a Dancefloor. She had not played a concert in Camden Town for 23 years and the booking was ­considered a musical coup. Mr Phillips’s first ­interview in three years came as Koko announced plans to fit a smoking roof on the flat terrace above the entrance. Designed to fit 40 smokers, leaseholders of the venue, the Mint Group, hope the terrace will be open before July. They mapped it out after facing problems in the wake of last year’s smoking ban. Koko came under fire after the smoking ban for fingerprinting clubbers heading out for a cigarette break – and ravers got even hotter under the collar over the imposition of a strict “five-minutes only” regime.